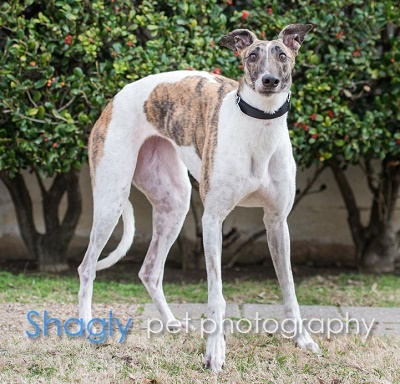 Maddy, racing name, Slatex Maddie Mae, is a 2 year old white with brindle ticking female born February 16, 2015. Her sire is KC and All and her dam is Slatex Cindel. Both parents were fairly successful racers. 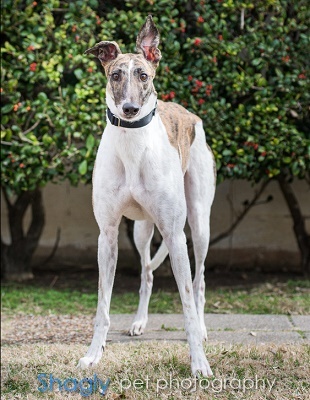 She comes to GALT from Valley Race Park in Harlingen where records show 3 races for her. It is not known at this time if Maddy will be small animal or cat tolerant.